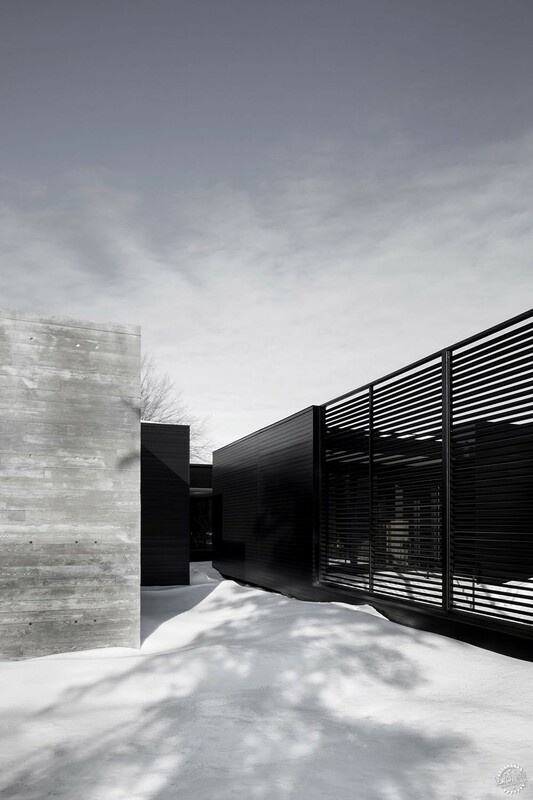 Board-formed concrete and black metal cladding characterise this house in rural Ontario by Alain Carle Architecte, which was designed to complement its man-made landscape. Named True North, the project is located near the Canadian city of Cornwall – next to the US border. Although the landscape appears to be natural, it is in fact formed by the opening of the Saint Lawrence Seaway created in the mid 20th century. 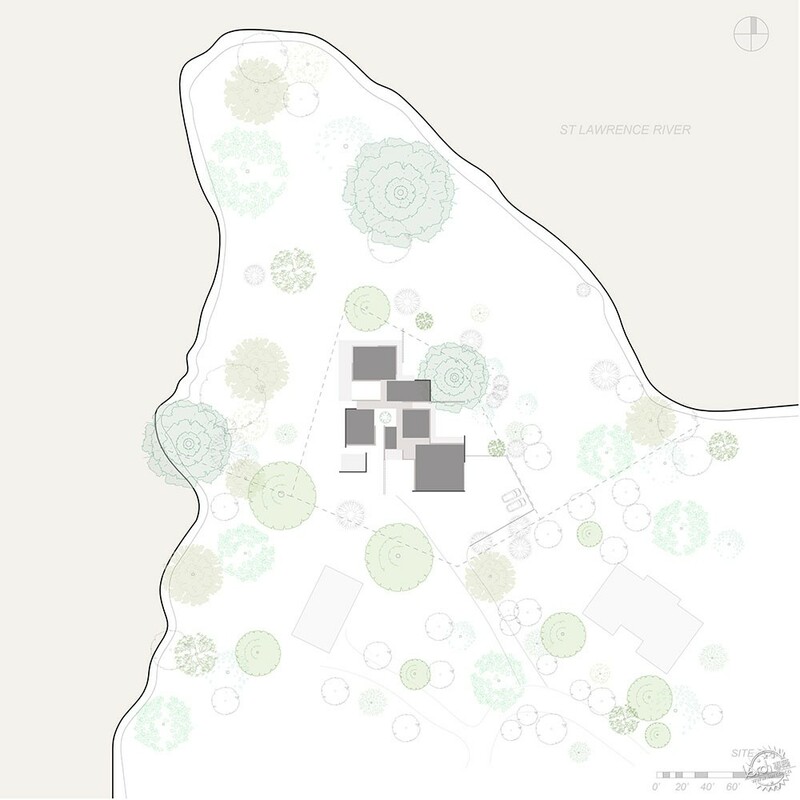 "The lot where the project sits was shaped from a residual partitioning of a generic plan of development allowing for a large waterfront that emphasises the horizontal lines dominating the landscape," said Alain Carle Architecte, based in Montreal. "These man-shaped coastlines, levelled by the flooding, consequently induce very strong wind conditions for this unobstructed plane of artificial landscape." 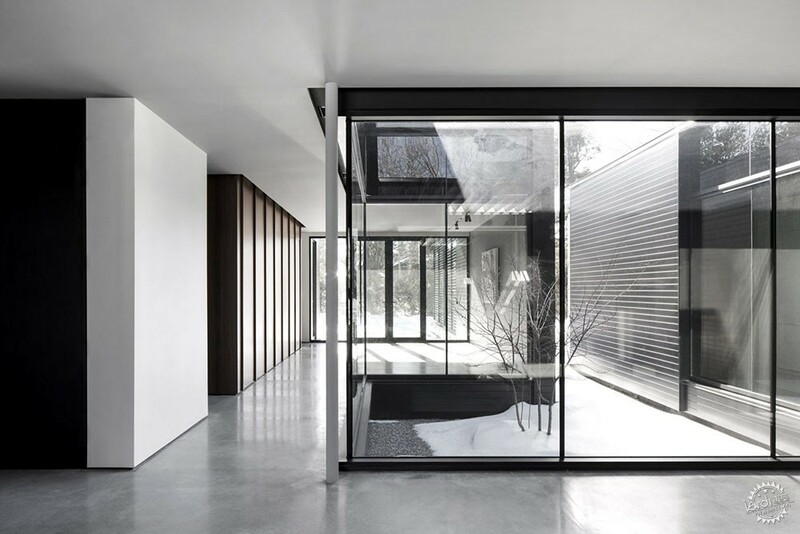 The studio sought to highlight the contradiction of a landscape that appears to look natural, but is actually constructed. "We approach the site in all its artificiality in order to re-inscribe the human experience in the most straightforward way possible," the team said. Orienting the home to the cardinal points, rather than to the local street grid, was one way to achieve this. 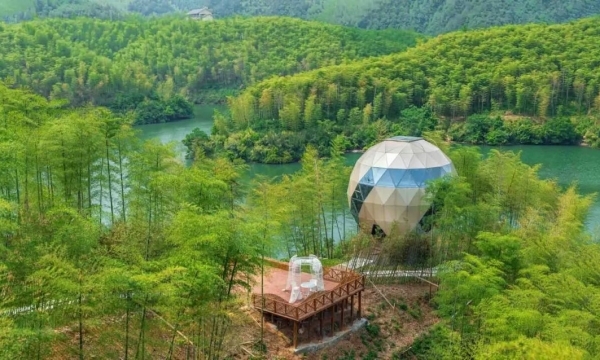 "The project proposes a direct relationship to the sky, horizon and wind rather than its immediate suburban surroundings," the studio said. Entrance is from the south, where there is a two-car garage and driveway. 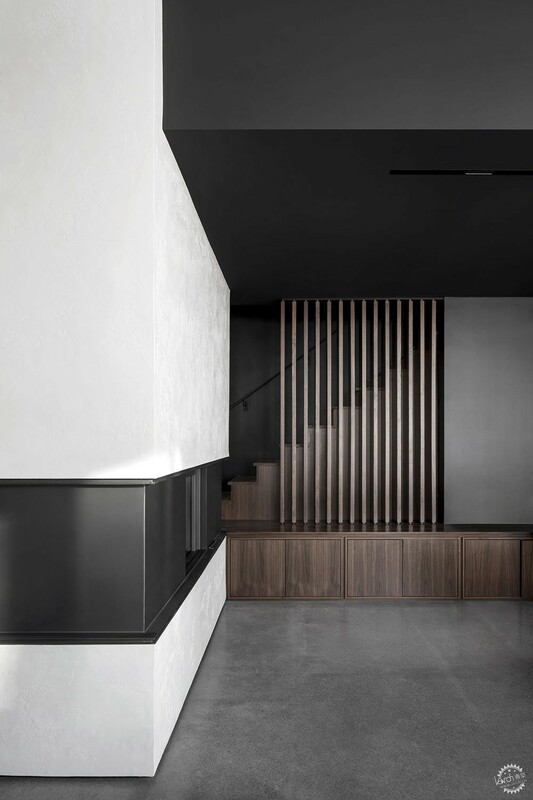 A short flight of stairs leads into a foyer. Three guest bedrooms are located to the right, one of which has its own ensuite. 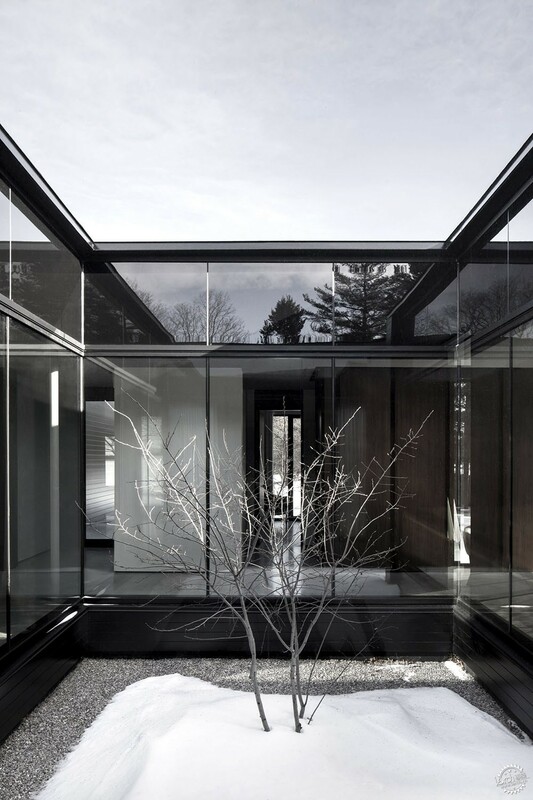 In the centre of the home, a glazed courtyard contains a tree, which is visible from multiple angles. The western portion of the low-slung home contains the master suite, which also faces the courtyard. 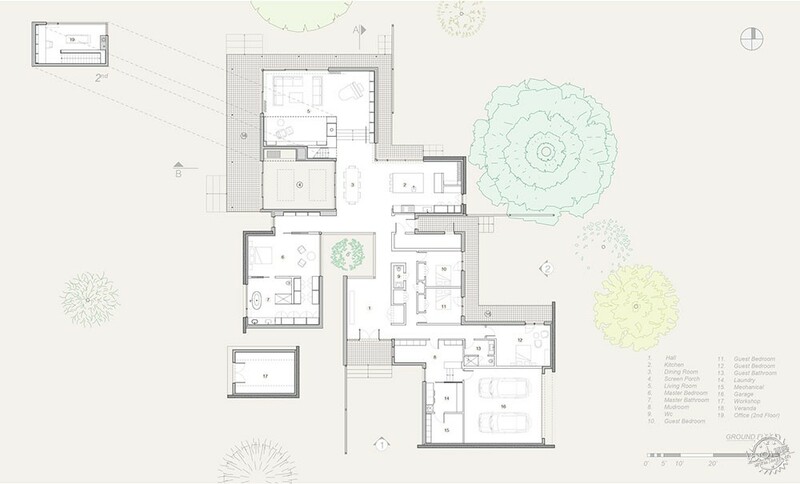 The kitchen and dining room are located beyond, roughly in the middle of the plan. The dining area sits adjacent to a screen porch that allows the residents to enjoy meals outdoors during the summer. A few steps separate the living room from the kitchen and dining area. It has views to the north and west, and is surrounded by a wraparound deck on all sides. 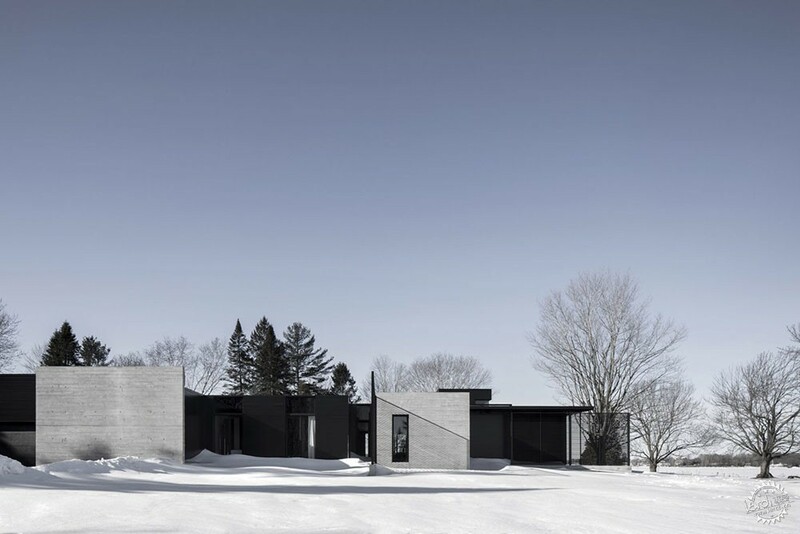 "[The house] becomes a device to perceive the landscape rather than a fixed, self-referenced architecture," said Alain Carle Architecte. 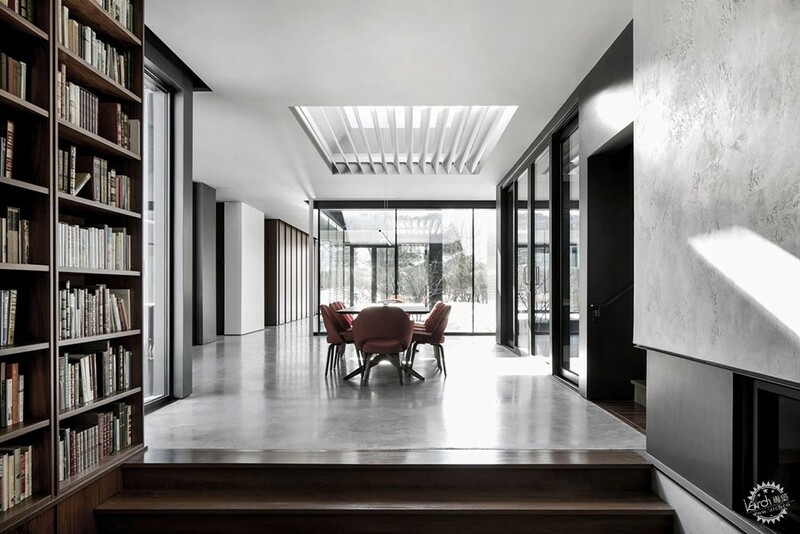 Although the home is mostly laid out on a single storey, a home office is perched above the living room, providing even better views of the extended horizon. 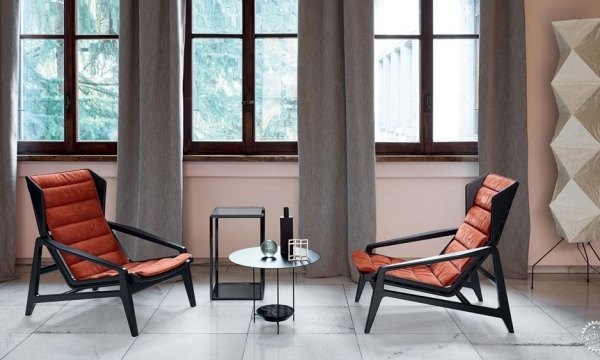 The architects chose industrial materials and minimal finishes for the home. 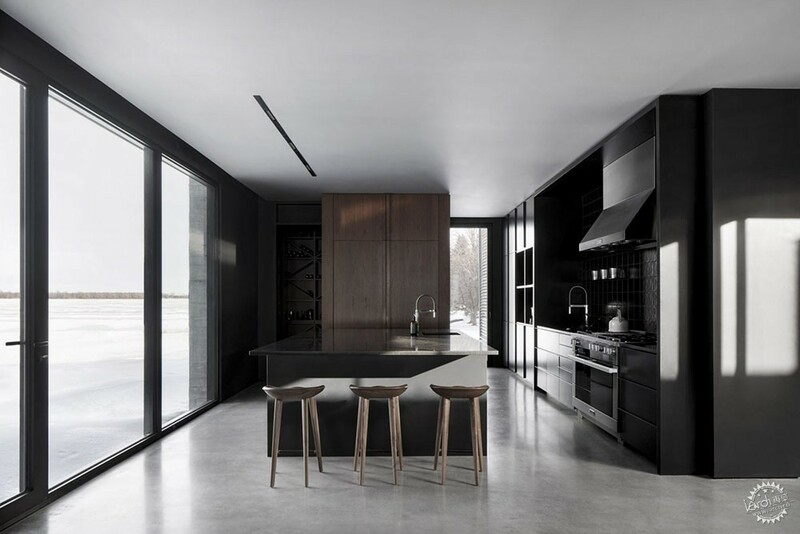 Concrete floors, grey and black walls, and dark wood accents define the interiors. 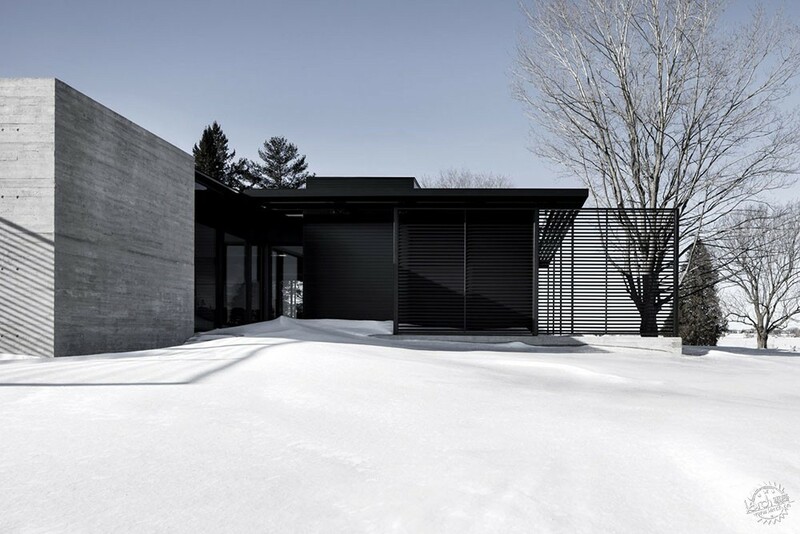 The exterior comprises board-formed concrete and black metal cladding. 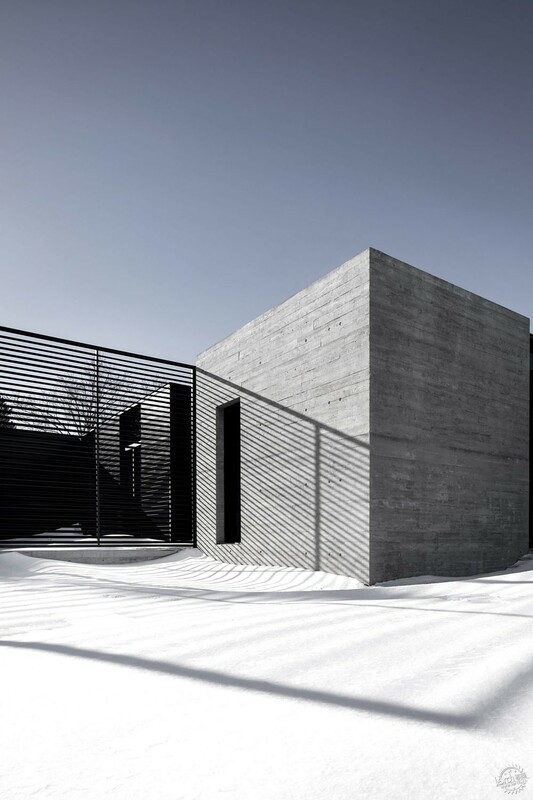 "The outskirts of the house are delineated by a permanent boundary in concrete, linked to the legal occupation of the site, while the house itself could have more flexible or ephemeral construct in metal," said the studio. 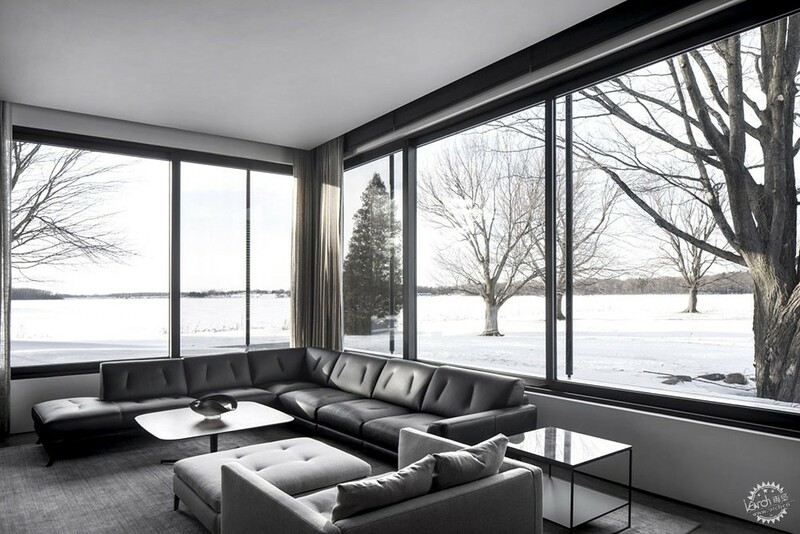 The Montreal-based firm is known for its secondary residences throughout Canada. 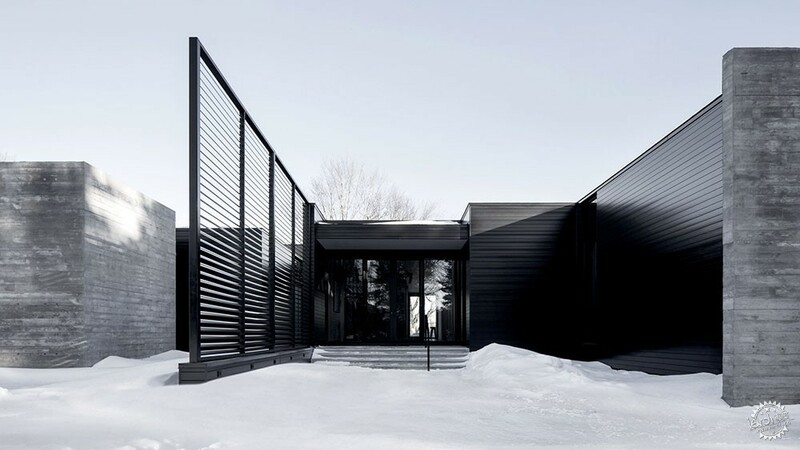 These include a home finished with burnt cedar cladding and a property made of four separate volumes that join in the centre – both located in Quebec. Photography is by Adrien Williams.